Fly high at Outer Limitz Trampoline Arena! 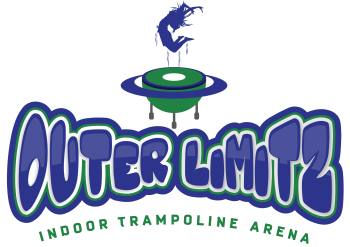 Outer Limitz Trampoline Arena is a cutting-edge entertainment, fitness and sports facility unlike anything you have ever experienced. Outer Limitz is the ideal location for active social outings, intense individual workouts and memorable birthday parties. We are the ultimate trampoline park! See what we have to offer below! Foam Pit: TWO lane foam pit. Practice flipping into our foam pit that consists of over 15,000 8"x8" foam cubes made of hypoallergenic and fire retardent foam. Flip with abandon! You will always have a soft landing into the cushy cubes of foam. Netted Ropes Obstacle Course: This Obstacle Course is suspended 14 feet above our Arcade area. Take the stairs up to the top then work your way through the many obstacles. The whole course is netted so if you fall, the net will catch you. Conquer your fear of heights. Be the bravest and the fasted to get through all of the obstacles. Test your balance and your bravery. Dodgeball Arena: Enjoy Dodgeball like never before! Jump, flip, dodge and dive. Trampolines provide a soft landing but can make you fly high. Use the walls and the ground. Be the last on standing. Main Trampoline Arena: HUGE Arena with 38 trampoline beds. Wall to Wall jump surface. Enjoy jumping and flipping. Fly high! Basketball Arena: TWO lane Basketball arena. Dunk like Jordan! Adjustable basketball hoops make it possible for anyone to experience the exhilerating feeling of dunking a basketball like a professional. Spider zone: 5 level Climbing structure. Each level has a maze of straps that you have to race through to make it to the top. Ring the bell at the top or use the balls to block people from reaching the summit!